The Boston University men’s hockey team’s 2016-17 season was always going to be defined by one thing: winning a national championship. Therefore, after losing last weekend in the NCAA Tournament’s quarterfinal round, head coach David Quinn had an honest assessment about his Terriers. 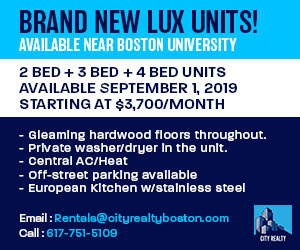 That’s the sort of standard that exists on Commonwealth Avenue, a place that’s seen five scarlet-and-white squads hoist college hockey’s biggest crown. Still, as Quinn hinted at, this year’s group — which had an average age of 20 years and seven months — can hardly be labeled a failure. It earned a share of the Hockey East regular-season title, posted a 6-6-1 record against NCAA Tournament teams, rattled off an eight-game winning streak and went 3-1 against Boston College, its bitter rival. There were high moments, too, including seven Terriers skating in the gold medal game of the World Junior Championships, another appearance at Frozen Fenway and a 10-member freshman class that earned three spots on the conference’s All-Rookie team (forwards Clayton Keller and Patrick Harper and goaltender Jake Oettinger). Still, the looming question was always going to be how BU, with 11 NHL draft picks and just three seniors, would handle its two-pronged Achilles Heel: youth and hype. As Quinn alluded to, there were moments when the Terriers struggled. The first half of the season was largely defined by penalties, a trend that contributed to BU finishing with the NCAA’s fourth-best penalty-penalty kill unit (87.1 percent success rate). Plus, on the tail end of being named the nation’s No. 1 team by USCHO.com, the Terriers were swept by Merrimack College for the first time in program history. Then came BU’s performance in big-time games, as it fell to Harvard University, a Frozen Four team, in the 65th Beanpot Tournament’s final. Then, in the semifinals of the Hockey East Tournament, Quinn’s group lost to BC. All things considered, though, Quinn felt his team started playing “more mature” hockey as the year unfolded. Perhaps the most profound example of that was the NCAA Tournament win in Fargo over the University of North Dakota, a 4-3 win in double overtime that featured a 56-save showing from Oettinger. The topic before the Terriers, therefore, is what 2017-18 could have in store. 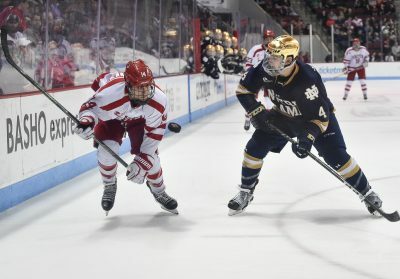 Keller and sophomore defenseman Charlie McAvoy have already signed professional contracts, foregoing the remainder of their careers at Agganis Arena. There are rumors, too, of junior defensemen John MacLeod and Brandon Hickey as well as sophomore forwards Jordan Greenway and Jakob Forsbacka Karlsson leaving early. Quinn, however, quelled those fears, saying he believes they’ll return. And, in another layer of hope, Quinn confirmed he’ll welcome an eight-member freshman class of forwards Shane Bowers, Brady Tkachuk, Logan Cockerill, Ty Amonte and Henry Crone and defensemen Kasper Kotkansalo, Cam Crotty and David Farrance. In short, the Terriers fell just short of their ultimate goal in 2016-17, but there’s optimism that they’re trending upwards. Had tickets to the Frozen Four in Chicago! Had to sell them. Hoping for next year!